رنجبر, زهرا, کرمی, عزت اله. (1392). برنامه‌های آموزشی-ترویجی و رابطه آن با میزان پایداری نظام‌های زراعی مورد مطالعه: گندم‌کاران شهرستان کرمانشاه. علوم ترویج و آموزش کشاورزی, 9(1), 1-14. زهرا رنجبر; عزت اله کرمی. "برنامه‌های آموزشی-ترویجی و رابطه آن با میزان پایداری نظام‌های زراعی مورد مطالعه: گندم‌کاران شهرستان کرمانشاه". علوم ترویج و آموزش کشاورزی, 9, 1, 1392, 1-14. رنجبر, زهرا, کرمی, عزت اله. (1392). 'برنامه‌های آموزشی-ترویجی و رابطه آن با میزان پایداری نظام‌های زراعی مورد مطالعه: گندم‌کاران شهرستان کرمانشاه', علوم ترویج و آموزش کشاورزی, 9(1), pp. 1-14. رنجبر, زهرا, کرمی, عزت اله. برنامه‌های آموزشی-ترویجی و رابطه آن با میزان پایداری نظام‌های زراعی مورد مطالعه: گندم‌کاران شهرستان کرمانشاه. علوم ترویج و آموزش کشاورزی, 1392; 9(1): 1-14. امروزه پرداختن به مسأله پایداری به‌ویژه در عرصه‌ی کشاورزی و نظام‌های زراعی، بیش از پیش مورد توجه قرار گرفته است. در این میان نقش برنامه‌های ترویجی به‌عنوان یکی از فاکتورهای مهم، انکارناپذیر می‌باشد. لذا هدف کلی پژوهش حاضر، بررسی رابطه‌ی برنامه‌های ترویجی ارائه شده و پایداری اراضی تحت کشت گندم آبی و دیم می‌باشد که در آن از تکنیک پیمایش و روش نمونه‌گیری طبقه‌بندی شده چند مرحله‌ای برای انتخاب 300 نفر از کشاورزان شهرستان کرمانشاه بهره گرفته شد. همچنین با پرسشنامه‌ای که روایی آن توسط اساتید و کارشناسان و پایایی آن با استفاده از مطالعه مقدماتی و محاسبه آلفای کرونباخ مورد تأیید قرار گرفت نسبت به جمع‌آوری داده‌ها اقدام گردید. یافته‌های به دست آمده نشان داد میزان استفاده کشاورزان از برنامه‌ها و خدمات آموزشی-ترویجی در هر دو نوع سیستم کشت (آبی و دیم) از میانگین پایینی برخوردار می‌باشد و این در حالی است که رابطه مثبت و معناداری بین میزان بهره‌مندی از برنامه‌ها و خدمات آموزشی-ترویجی با ابعاد سه‌گانه پایداری به دست آمد. بنابراین پیشنهاد می‌شود افزایش کارآیی و اثربخشی برنامه‌های ترویجی، استفاده از روش‌های متنوع آموزشی متناسب با نیازها و تحصیلات کشاورزان، مورد توجه دست‌اندرکاران طراحی و اجرای برنامه‌های ترویجی قرار گیرد. Considering the potential of agricultural extension programs on promoting sustainable knowledge and practices, the main aim of this survey research was to explore the impact of agricultural extension programs on the sustainability of irrigated and rain fed wheat production systems. 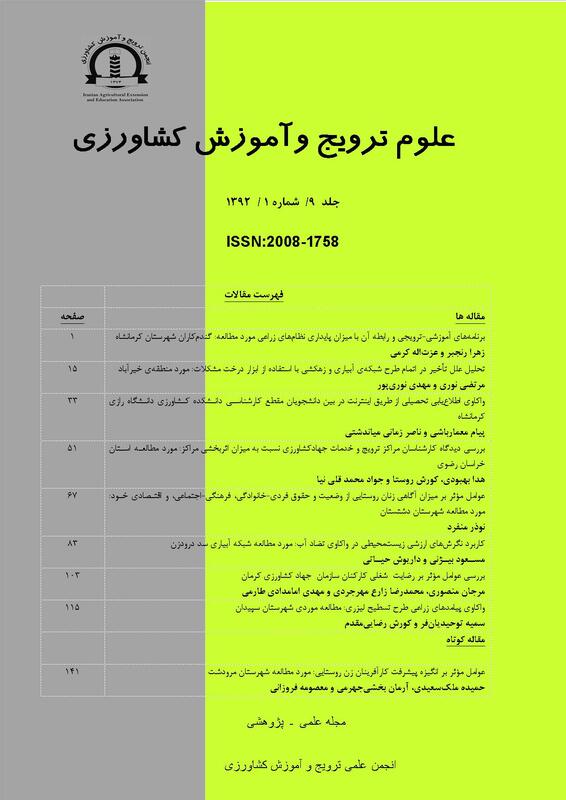 A survey was conducted using a multi-stage stratified random sample of 300 farmers of Kermanshah County. A semi-structured questionnaire was designed to collect data. Despite the rather low use of the extension programs and services by farmers the findings revealed the importance of extension services as a predictor of sustainability of both irrigated and rain fed wheat production systems. There were a positive significant relationship between extension services and the three dimensions of sustainability. Improving the effectiveness and efficiency of extension programs are recommended as means of achieving sustainability. ایروانی، ه. و دربان آستانه، ع. (1383). اندازه­گیری، تحلیل و تبیین پایداری واحدهای بهره‌برداری (مطالعه موردی: گندم‌کاران استان تهران). علوم کشاورزی ایران، جلد 35، شماره اول، صص 52-39. حیاتی، د. (1374). سازه‌های اجتماعی-اقتصادی و تولیدی-زراعی بر متغیرهای دانش فنی گندمکاران در تولید گندم، دانش فنی آنها در زمینه کشاورزی پایدار، میزان پایداری نظام زراعی و متوسط عملکرد گندم. پایان نامه کارشناسی‌ارشد، دانشکده کشاورزی، دانشگاه شیراز. منتشر نشده. رضائی‌مقدم، ک. (1376). ترویج کشاورزی، فقر و کشاورزی پایدار در شهرستان بهبهان. پایان نامه کارشناسی‌ارشد، دانشکده کشاورزی. دانشگاه شیراز. منتشر نشده. صدیقی، ح. و روستا، ک. (1381). بررسی پایداری نظام زراعی در واحدهای کشاورزی نمونه. مجله کشاورزی، شماره 2، صص60-49. عربیون، ا.، کلانتری، خ.، اسدی، ع. و شعبانعلی فمی، ح. (1388). سنجش سطح پایداری نظام کشت گندم در استان فارس و تعیین عوامل موثر بر آن. علوم ترویج و آموزش کشاورزی ایران، جلد 5، شماره2، صص 29-17. عمانی، ا. و چیذری، م. (1385). تعیین ویژگی‌های اجتماعی، اقتصادی و زراعی گندم‌کاران شهرستان­های اهواز، دزفول و بهبهان با توجه به پذیرش روش­های کشاورزی پایدار کم­نهاده. علوم و فنون کشاورزی و منابع طبیعی، سال دهم، شماره اول، صص 119-107. عنایتی راد، م.، آجیلی، ع.، رضایی مقدم، ک. و بیژنی، م. (1388). عوامل مؤثر بر دانش کشاورزان ذرت‌کار در زمینه کشاورزی پایدار در منطقه شمال غرب خوزستان. علوم ترویج و آموزش کشاورزی ایران، جلد 5، شماره 2، صص 69-59. کرمی، ع. (1378). رابطه سازه‌های اجتماعی-اقتصادی، با دانش فنی و کشاورزی پایدار در بین گندم‌کاران. مجموعه مقالات اقتصاد گندم، ناشر: مؤسسه پژوهش‌های برنامه­ریزی و اقتصاد کشاورزی. کلانتری، خ. و میرگوهر، م. (1381). بررسی عوامل مؤثر بر سطح و میزان کاربرد دانش فنی و نقش آن‌ها در عملکرد زراعت گندم آبی مطالعه موردی استان‌های تهران و اصفهان. اقتصاد کشاورزی و توسعه، سال دهم، شماره 40، صص126-103. مقصودی، ط.، ایروانی، ه.، موحدمحمدی، ح. و اسدی، ع. (1385). تحلیل رگرسیونی عوامل مؤثر بر پایداری کشت سیب‌زمینی در شهرستان فریدونشهر. روستا و توسعه، سال نهم، شماره 3 (پیاپی 35)، صص 169-153. یعقوبی، ا.، چیذری، م.، فعلی، س. و پزشکی‌راد، غ. (1389). عوامل مؤثر بر مدیریت ریسک در بین کشاورزان گندم‌کار دیم شهرستان تفرش. علوم ترویج و آموزش کشاورزی ایران، جلد6، شماره1، صص 101-91. Anonymous. (2003). Survey of public awareness and attitude toward environment. Available at: <http://www.ncb.innet.mu/eurd/minenv/download/survey1.d.P.1-9. Becker, B. (1997). Sustainability Assessment: A review of values, concepts, and methodological approaches. Issues in Agriculture 10. United State: Consultative Group on International Agricultural Research. Bosshard, A. (2000). A methodology and terminology of sustainability assessment and its perspectives for rural planning. Agriculture, Ecosystems and Environment, 77(1): 29–41. Calker, K. J., Romero, C., Berentsen, P. B. M., Giesen, G. W. J. and Huirne, R. B. M. (2006). Development and application of a multi-attribute sustainability function for Dutch dairy farming systems. Ecological Economics, 57(4): 640-658. Cauwenberg, N. V., Biala, K., Bielders, C., Brouckaert, V., Franchois, C., Cidad, V.G., Hermy, M., Mathijs, E., Muys, B., Reijnders, J., Sauvenier, X., Valckx, J., Vanclooster, M., der Veken, B.V., Wauters, E. and Peeters, A. (2007). SAFE— A hierarchical framework for assessing the sustainability of agricultural systems. Agriculture, Ecosystems and Environment, 120(2): 229–242. Comer, S., Ekanem, E., Muhammad, S., Singh, S. and Tegegne, F. (1999). Sustainable and conventional farmers : A comparison of socio-economic characteristics, attitude , and beliefs. Sustainable Agriculture, 15(1):29-45. Dantsis T, Douma C, Giourga C, Loumou A, Polychronaki EA. (2010). A methodological approach to assess and compare the sustainability level of agricultural plant production systems. Ecological Indicators, 10(2):256–263. Gafsi, M., Legagneux, B., Nguyen, G. and Robin, P. (2006). Towards sustainable farming systems: Effectiveness and deficiency of the French procedure of sustainable agriculture. Agricultural Systems, 90(1-3): 226–242. Gomez-Limon J. and Riesgo, L. (2009). Alternative approaches to the construction of a composite indicator of agricultural sustainability: An application to irrigated agriculture in the Duero basin in Spain. Environmental Management, 90(11): 3345–3362. Herzog, F. and Gotsch, N. (1998). Assessing the sustainability of smallholder tree crop production in the tropics: A methodological outline . Sustainable Agriculture, 11(4):13-37. Horrigan, L., Awrence, R.and walker, S. (2002). How sustainable agriculture can address the environment and human health harms of industrial agriculture. Environmental Health Perspective, 110(5) 445-475. Ingels, C., Campbell, D., George, M. R. and Bradford, E. (1997). what is sustainable agriculture? Available at: <www.sarep.ucdavis.edu/concept.htm. Karami, E. (1995). Agricultural Extension: The question of sustainable development in Iran. Sustainable Agriculture, 5(1/2):61-72. Karami, E., Zamani, G. H., Lari, M.B. and Hawkins, H.S. (1993). Agricultural development: The impact of communication. Iran Agricultural Research, 12: 29-50. Lee,Y. J. and Huang, C. M. (2007). Sustainability index for Taipei. Environmental Impact Assessment Review, 27(6):1-17. Lichtenberg, E. and Zimmerman, R. (1999). Information and farmers' attitudes about pesticides, water quality, and related environmental effects. Agriculture, Ecosystems and Environment, 73(3): 227-236. Lyson, T. A. (1998). Environmental , economic and social aspects of sustainable agriculture in American Land Grant Universities. Journal of Sustainable Agriculture, 12(2/3):119-130. Munda, G. (2004). "Decision Aiding Social multi-criteria evaluation :Methodological Foundations and operational consequences. European Journal of Operational Research, 158: 662–677. Norman, D., Janke, R., Freyenberger, S., Schurle, B. and Kok, H. (1998). Defining and implementing sustainable agriculture. Kansas sustainable agriculture Series, Paper #1. Prandl-Zika, V. (2008). "From subsistence farming towards a multifunctional agriculture: Sustainability in the Chinese rural reality. Environmental Management, 87(2): 236–248. Praneetvatakul, S., Janekarnkij, P., Potchanasin, C. and Prayoonwong , K. (2001). Assessing the sustainability of agriculture A case of Mae Chaem Catchment, northern Thailand. Environment International., 27: 103–109. Rasul, G. and Thapa, G. B. (2003). Sustainability Analysis of Ecological and Conventional Agricultural Systems in Bangladesh. World Development, 31(10): 1721–1741. Rasul, G., and Thapa, G. B. (2004). Sustainability of ecological and conventional agricultural systems in Bangladesh: an assessment based on environmental, economic and social perspectives. Agricultural Systems, 79: 327–351. Rousan, L. M. (2007). Factor Influencing Adoption of Improved Farm Practices among Women Farmers in Northern Jordan. American-Eurasian Journal Agricultural and Environmental Sciences, 2(3): 220-226. Salamon, S., Fransworth, R. L., Bullock, D. G. and Yusuf, R. (1997). Family factors affecting on adoption of sustainable farming systems. Soil and Water Conserve 52(2): 265-270. Saltiel, J., Baunder, J.W. and Palakovich, S. (1994). Adoption of sustainable agricultural practices: diffusion, farm structure and profitability. Rural Sociology, 59(2): 333-347. Sands, G. R. and Podmore, H. (2000). A generalized environmental sustainability index for agricultural systems. Agriculture, Ecosystems and Environment, 79(1): 29–41. Scheaffer, R.L., Mendenhall, W. and Ott, L. (1996).Elementary survey sampling. Duxbury Press, Belmont: California. Sydorovych , O. and Wossink, A. (2008). The meaning of agricultural sustainability: Evidence from a conjoint choice survey. Agricultural Systems, 98(1): 10–20. Sykanda, P. (2007). Quality of information sources in agricultural Extension for poultry farmers in southern Ontario. A thesis presented to the faculty of graduate studies of the University of Gulf. Wapet, S., Chandtrapatya, S. and Buranatanung, N. (2005). Factors Affecting the Adoption and Non-adoption of Sloping Land Conservation Farming Practices by Small-scale Farmers in Thailand. Wu, C. (1997). Education inform production: the case of Taiwan. Agricultural Economics, 59(4): 699-709.